Venom represents the final result of a long-standing attempt by Sony Pictures to give the popular Spider-Man nemesis his own film. Influenced equally by the comic books and the Deadpool movies, Venom falls considerably short of the high bar set this year by the likes of Black Panther and Avengers: Infinity War. With its short length and jokey tone, the movie feels more like a second-rate knock-off than a legitimate attempt to start a franchise for the Jekyll and Hyde symbiotic title character. To the extent that Venom works, it's as a comedy not an action/adventure superhero film. When last we saw Venom, he was getting lost in the macabre mess that was Sam Raimi's Spider-Man 3. It has taken eleven years for this reboot to get off the ground, with Topher Grace being ably replaced by Tom Hardy, whose comic book cred includes having played Bane in The Dark Knight Rises. 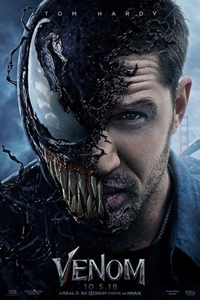 Hardy takes over the role of investigative reporter Eddie Brock, who has relocated from New York City to San Francisco. (Although the movie is light on Spider-Man references, there's a Superman call-out when Kryptonite is mentioned - probably the first time there has been a DC reference in a movie featuring a Marvel character.) This is far from Hardy's most impressive performance but, since he took the role for his son, the lack of depth and passion can be forgiven. Director Ruben Fleischer (Zombieland) originally intended for Venom to be R-rated and that seems to be the appropriate rating for a film about a dark anti-hero who eats people's heads. Keeping in mind a possible future cross-over with the MCU, Sony opted for a PG-13 rating which required significant cutting and re-aligning of shots to imply massive carnage without actually showing it (at least not graphically). It feels more than a little dishonest but that's not the only problem with the film's look and tone, both of which are "off." The movie appears cheap and tawdry with unconvincingly silly CGI (Venom resembles a clown more than a horror monster). The short length, likely the result of overzealous editing, not only opens up plot holes but dilutes any "epic" expectations. Venom feels more like an afterthought - a promising idea gone wrong somewhere along the way. Yes, it's good for a few laughs - the alien creature's thoughts, which we hear, are replete with amusing one liners, and there are moments of slapstick humor that are as unexpected as they are welcome. The movie takes about a half-hour (nearly a third of its running length) to get off the ground as it puts all the players in place. There's Eddie, the intrepid reporter who goes too far in pursuing one of his stories. Riz Ahmed's Carlton Drake is a standard-order Lex Luthor wannabe with an ego to match his fortune and a desire to ignore ethical considerations when doing scientific experimentation. Eddie briefly has a fiancé, the devoted Anne Weying (Michelle Williams), who dumps him when he breaches her trust and gets her fired. Finally, there's the venom creature, an alien entity brought to earth and trapped in Drake's lab until one of the billionaire's underlings (Jenny Slate) grows a conscience and sneaks Eddie in so he can do a story. Things get out of hand, Eddie gets too close to the alien, symbiosis occurs, and Venom is born. To start with, there's an intriguing Jekyll and Hyde interplay between straight man Eddie and stand-up comedian Venom as the two trade barbs within the former's mind. Eventually, however, the filmmakers decide this isn't interesting enough so they give Venom a more tangible presence, evolving him from extensions of Eddie to his own partially-independent entity. There are scenes in which he completely takes over (providing a hulking "suit" for the smaller human), causing one to wonder about things like where all the extra matter comes from. Most of the action scenes are perfunctory and the Big Special Effects Battle At The End (c'mon, you know it's coming - you can't call that a spoiler) is a bit of an anti-climax, especially since it's essentially animated. Although Venom is forgettable and insignificant, it's not really deserving of scorn and derision. It's over quickly enough that it doesn't cross the "pain" threshold of something that lingers for too long and it offers enough laughs (all intentional, I might add) that it's sometimes effective as a distraction. It's just not an especially good superhero movie and it wastes an intriguing premise. Done right, Venom could have been a deliciously conflicted character. Done wrong, we get what the movie provides - a cartoonish entity who can only unleash its base instincts on "bad people." The mid-credits sequence contains a cameo that offers a glimpse of where a potential Venom franchise could be headed. Will it get there? Hard to say (box office performance will, as always, be the determining factor) but there's little in the first installment to get me excited about a return engagement. There's nothing wrong with superhero movies existing outside the MCU but one hopes that future filmmakers considering such endeavors will opt for something less cheap, cheesy, and generally unsatisfying as the one Fleisher and his creative team have produced.